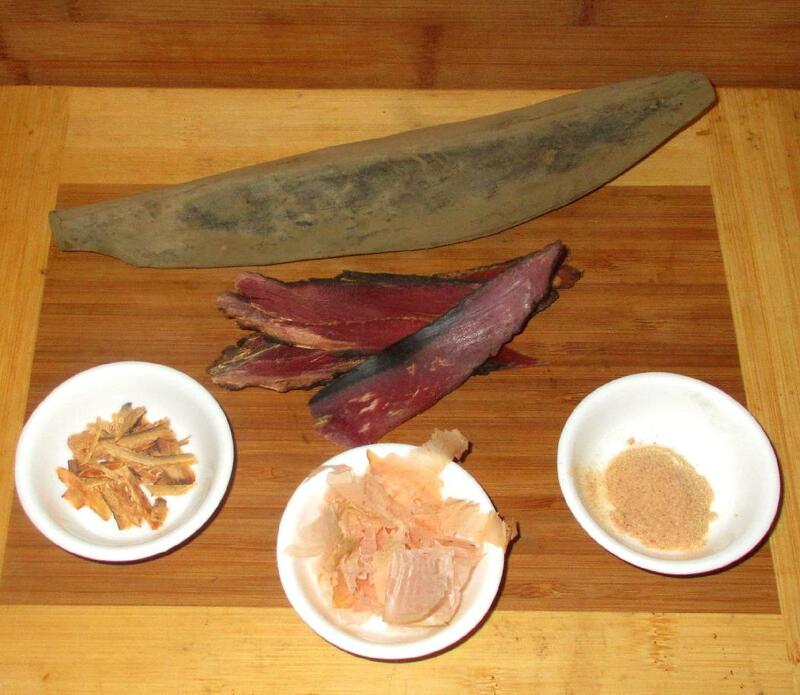 When purchased whole (see the thing that looks like a chunk of dried wood in the first picture), Katsuobushi is first shaved as needed for use, and, for some purposes, can even be powdered. Aside from making dashi, the shavings (when very thin) are also used as a garnish and flavoring for a number of other preparations. They are used as a filling for the rice balls known as OnigirI, ground and added to Furikake seasonings, and sprinkled as a tasty topping on many dishes, especially the Japanese ‘pizza’ known as Okonomayaki. Purchasing Katsuobushi in a solid block is the most expensive way to do so, but the expense pays off in that you can shave it however you like and the larger pieces keep much longer than the delicate flakes or the powdered variety. Here you can see that, once cut, the interior is a lovely, rich ruby-red color in contrast to the woody dullness of the surface. In Japan, the traditional method of shaving the blocks is with a specialized device known as a ‘kezuriki’ that consists of a blade inverted in the top of a wooden box and resembles a cross between a European kitchen ‘Mandolin’ and a carpenter’s plane. Absent this, however, a good sturdy vegetable peeler can be used in its stead. 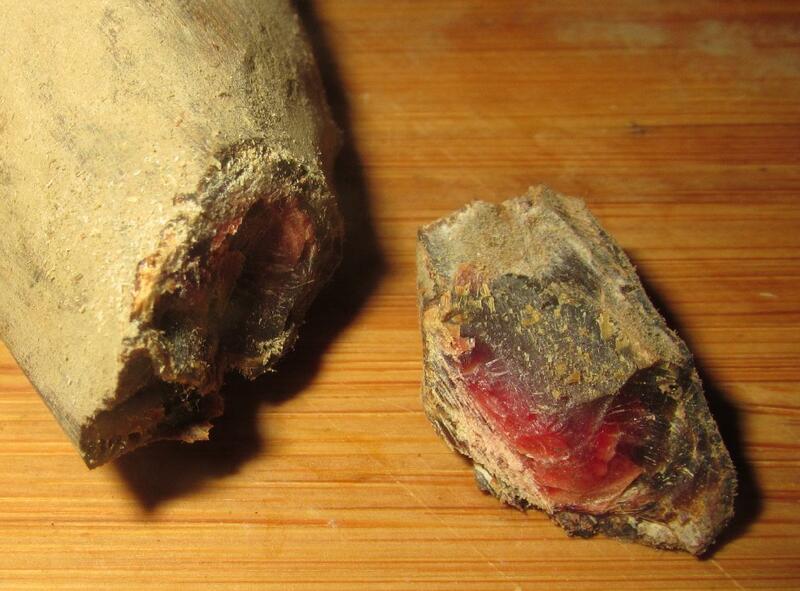 Katsuobushi can also be purchased in pre-shaved packages of varying thickness. 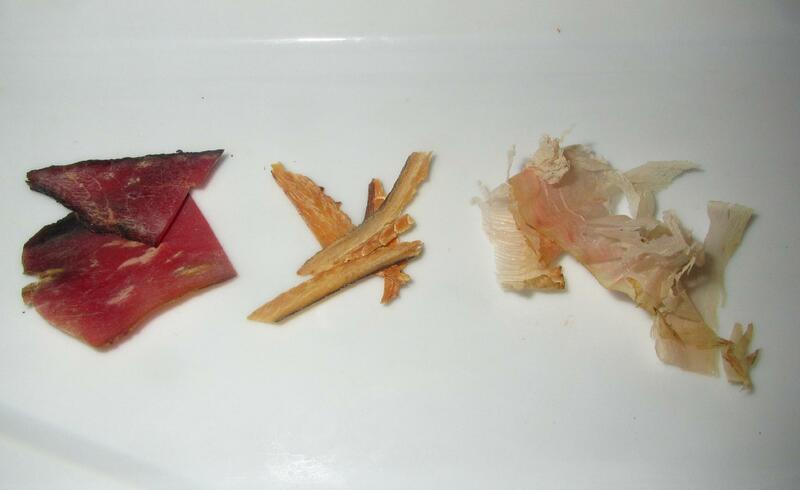 The very thick and moderately thick shavings pictured at the left of the above picture are examples of ‘Kezurikatsuo’ and are traditionally the preferred type for making Dashi. The paper-thin variety on the right, known as ‘hanakatsuo’ is intended for use in other preparations such as those mentioned earlier. 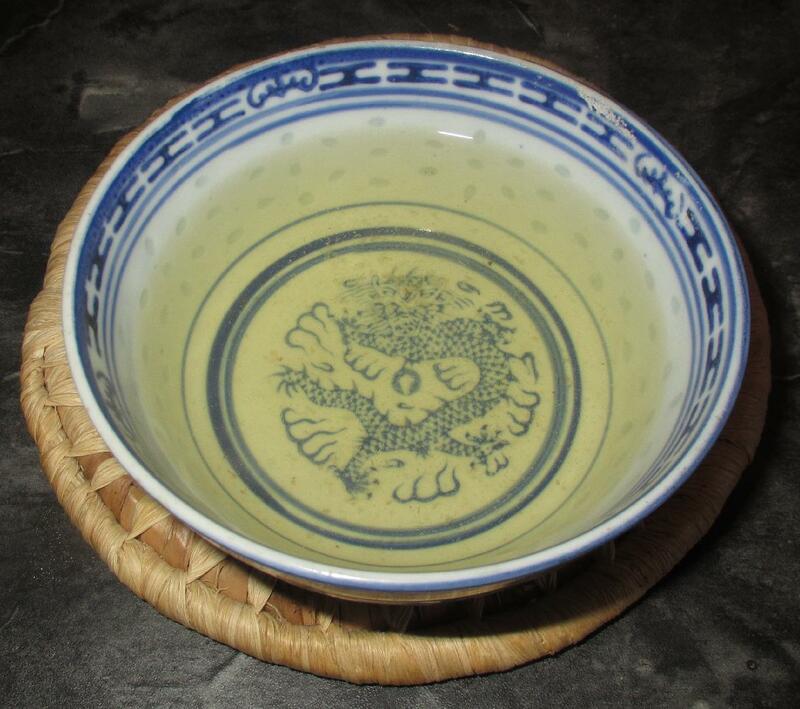 Nowadays, however, the hanakatsuo type is frequently used for making dashi and, indeed, in many recipes, both in cookery books and online, it is this sort that seems to be favored. 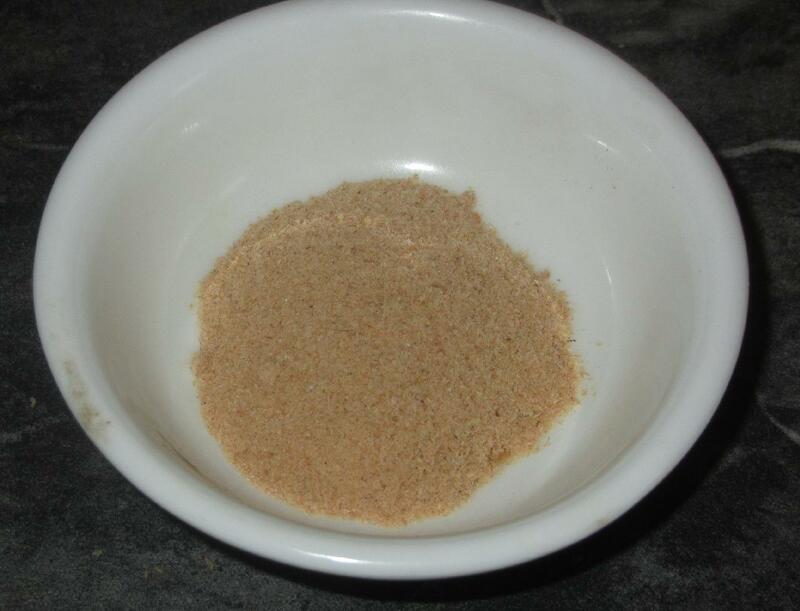 The powdered variety could, in a pinch, be used rather as a bouillon powder for making stock, but is more commonly used as a seasoning, either during cooking, or at the table. I would recommend against using it for making stock, and, indeed, against purchasing it at all. It doesn’t not keep well, as the flavor diminishes more rapidly the more highly processed the product is, and it as far better to simply grind up shavings as required. The taste of Katsuobushi is quite smoky but with an underlying flavor, to my mind, of canned (as opposed to raw, fresh) tuna. It is the smokiness that gives dashi its characteristic quality and, as the flakes or shavings age, and diminish in quality, the smokiness persists as the fish taste fades. Very fresh shavings have a bit of a sweetness to them but, as they become progressively more stale, they can even get a little bitter. While the basic, most common form of dashi is made with both Katsuobushi and Kombu seaweed, a useful broth can be made using just the fish. The amount to be used will depend to some degree on the thickness and freshness of the shavings but a simple rule of thumb is a to use a handful for every two cups of water; a very generous one for hanakatsuo, and somewhat smaller if using kezirikatsuo. 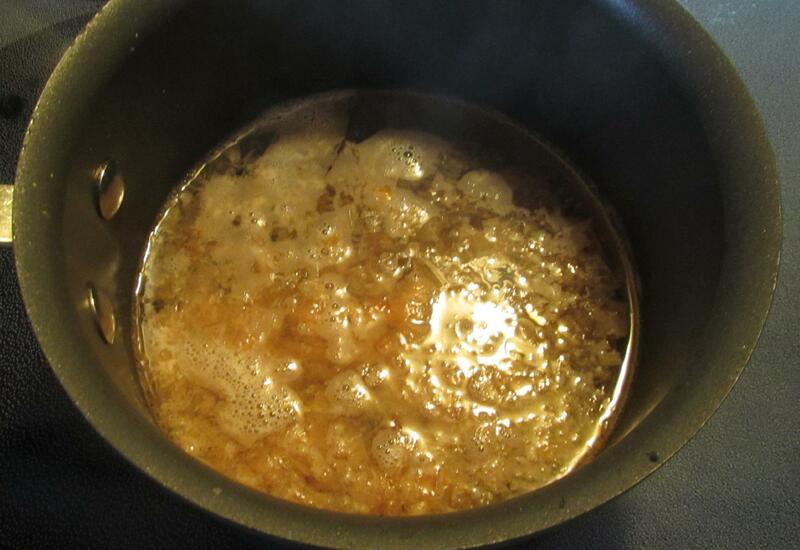 The basic technique is to bring the water to a boil, add the Katsuobushi, and then remove the pot from the heat. Allow to cool for a few minutes, during which time the shavings will settle, and then strain away leaving a pale, flavorful stock. The length of the steeping time will again vary with the thickness of the shavings and you can experiment to see what works best with whatever you happen to have. Look for flakes or shavings that have a tinge of pink and avoid those that are a dull tan color and starting to fragment.